Las Vegas Sands and The Madison Square Garden Company have announced plans to build a new 17,500 seat arena behind Sands properties The Venetian and Palazzo. The partnership was announced in a press release earlier today and will also involve Azoff MSG Entertainment, Live Nation, and Oak View Group. At first glance this seems like a direct competitor to MGM's new T-Mobile Arena, however this venue will be slightly different as it will be designed for music concerts first and foremost. The arena won't be hosting an NBA or NHL team, but UFC and boxing might be a possibility. The first question is whether Las Vegas really needs another arena like this. Along with the new T-Mobile Arena many other large music venues scatter the Strip including MGM Grand Garden Arena, Mandalay Bay Events Center, Axis at Planet Hollywood, The Colosseum at Caesars, and the upcoming new Monte Carlo Theater. I'm guessing Sands and MSG have done their homework and determined the demand will be there. MSG has apparently had great success in the Los Angeles area by remodeling the Forum to a similar music centered arena. It will also be interesting to see what kind of amenities will surround the arena. Sands will be building a walkway back, but it's not really clear if there will be any dining and shopping similar to The Linq Promenade and The Park. 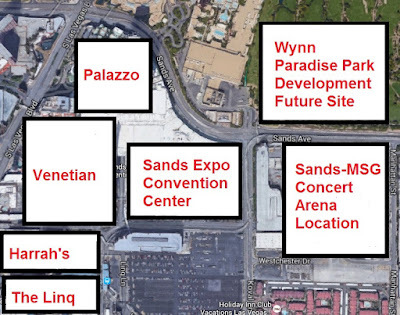 Another angle is the arena's close proximity to the upcoming Wynn Paradise Park development. 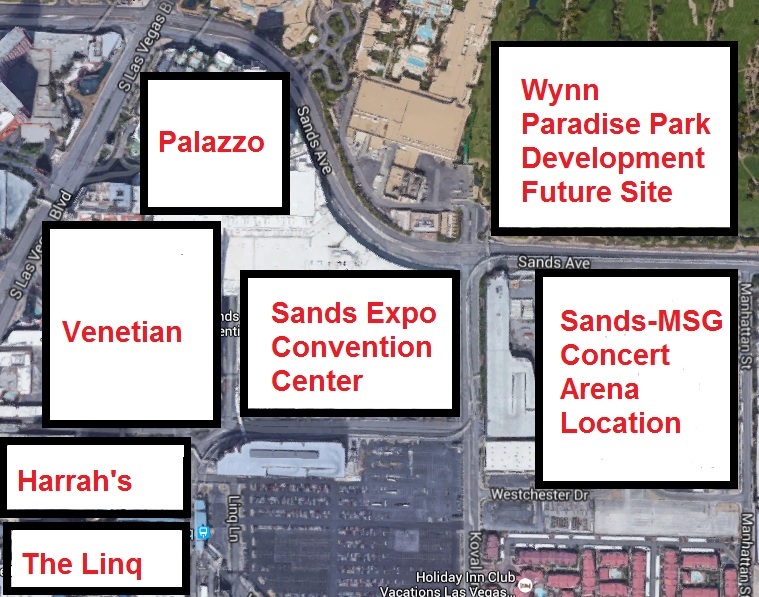 I suppose there could be some synergies if Wynn and Sands were willing to work together to create some kind of pedestrian access between the two.